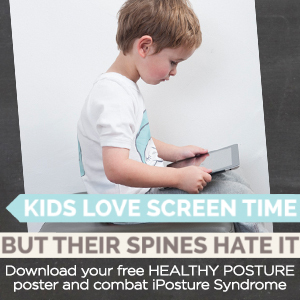 To get your kids on board with the effects of poor posture or hunching why don’t you try this simple experiment? Sit your child at the table with chair tucked in and arm bent as though about to have an arm wrestle but palm facing the ceiling. Get a three to four kilo bag of potatoes, rice etc and get your child to balance it on their hand. Get them to bend the elbow as far as it goes so that the weight is very close to them. Ask them to think about how heavy the bag feels and if their muscles are working hard to hold the bag up. Then get them to gradually move the weight away from them, noticing that the further the weight is away from their body the heavier the load feels and the harder the muscles have to work. Explain to them this is what happens when they hunch over their computer. The muscles of their neck and back have to work so much harder to carry the weight of the head when they stoop and this can really affect their health and wellbeing. (You may want to elaborate and tell them that it can affect how well they breath, they digest food and even how well they think! Maybe less time slouching means more productive working meaning getting their homework done more quickly!!! Hopefully they will think of this little experiment when they next ‘adopt the position’ slouching over their laptop on the sofa!